We're at the era of history where King Edward VIII abdicated so he could marry Mrs. Wallis Simpson, a twice-divorced American; and his brother, George, becomes King. I couldn't locate (easily or quickly!!!) a book detailing the abdication, writtten in a more story styled format - that wasn't seriously *adult* in tone - so we've stuck with some non-fiction references, and online articles. The BBC have some interesting extra's to listen to and read through. The natural progression after the abdication, for us, was to study the coronation of King George VI. One of the items we've covered was his struggle to over come his stutter. As a family we listened to our library's downloadable copy of the BBC's (short!) audio reproduction of background events leading up to his coronation speech. You can listen to a sample of that here. King Georg VI's actual Coronation speech can be heard via youtube. 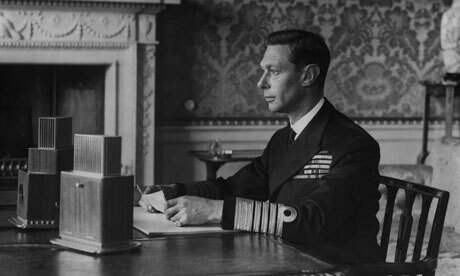 Here is King George VI's speech leading up to WWII. WWII is our next topic of study, after our scheduled week off. Next week, for me, is a solid week of spring cleaning and resorting. Really interesting especially the links to the speeches. I recently read "The king's speech" which was written by Lionel Logue's grandson-a fascinating read. Not sure whether it is suitable for children-I didn't read it with them in mind. It doesn't have the swearing that I'm told is in the film but they might find a whole book on the subject of the King's speech problems a bit long.